Seating with an edge. Get the classic look of an accent chair combined with the function of an office chair with this modern task chair. Faux leather brings an edgy, yet sophisticated vibe to the home office, making it a place that exudes style. Upgrade your home office with the Layton office chair. Fabric or faux leather seat and back with built-in lumbar support. One-touch pneumatic seat height adjustment. Locking tilt control with adjustable tilt tension. Heavy duty gold finish base with dual wheel carpet casters. Pneumatic Seat Height Adjustment, Allows for quick and easy adjustment to regulate chair height relative to the floor. 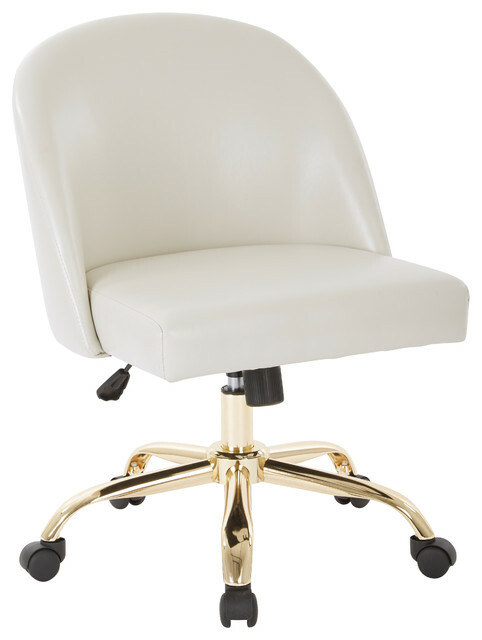 360 Swivel, Chair rotates a full 360 in either direction for ease of motion. Standard on every executive and task chair. GREENGUARD: No. Country of Origin: CHN. Fabric Info: (U28)Faux Leather Cream. Fabric Material: PU, AKA Polyurethane. Outer Materials: Fabric/Metal,Nylon. Assembled Dimensions: 23"W x 24"D x 36"H. Assembly Required: Yes. Net Weight: 23 lbs. Weight Capacity: 250 lbs. Color: Cream. Seat Dimensions: 20.5"W x 18"D x18.75-22.25"H.
Back Dimensions: 22.75"W x 15"H x 4.5"T.
Seat Range Height: 4.5". Seat Thickness: 3.75". W 22.75" / D 24.25" / H 35.75" / 23 lb.